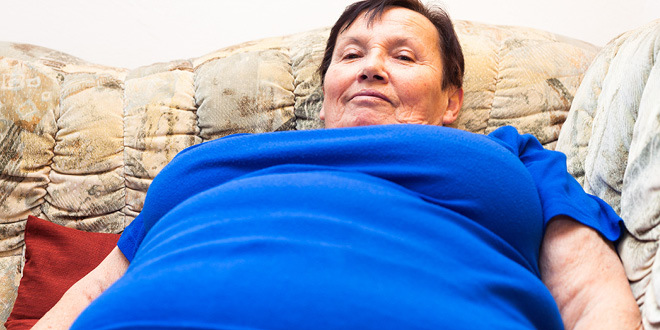 Obese middle aged and older individuals are at higher risk of memory problems that can lead to dementia. Researchers have discovered that being overweight alters the function of genes critical for a healthy memory in the hippocampus of the brain. In animal experiments, overweight mice perform poorly in laboratory memory tests. In humans, a great deal of earlier research has linked obesity (particularly abdominal obesity) with poorer memory, a smaller brain and increased risk of dementia. We also know that people with type 2 diabetes are at much greater risk of dementia and most of those individuals are overweight, particularly in the abdominal region. Obesity raises the level of inflammation in your body because fat cells produce a range of cytokines (inflammatory chemicals) that can cause destructive wear and tear to your body. The dry weight of your brain is approximately 60 percent fat, and fats are extremely sensitive to harm from these chemicals. Alzheimer’s disease is the most common form of dementia and currently affects approximately 13 million people in the world. In the U.S. almost 1,000 people a day are diagnosed with Alzheimer’s. There is no cure for advanced Alzheimer’s disease; that’s why prevention and early detection are so critical. To read about how you can help prevent or greatly reduce your risk of dementia, see my book Alzheimer’s: What you must know to protect your brain I offer a sensible, easy-to-follow 4 point program to protect and improve your brain; this can add many healthy and productive years to your life and represents your best chance for saving your brain by using a common-sense approach to living and the latest advances in nutritional medicine.